NIA CHARLESTOWN NEVIS (November 24, 2014) –Four Seasons Resort Estates (FSRE) Nevis is committed to building all the homes at Villas on Pinney’s Beach with only local contractors. 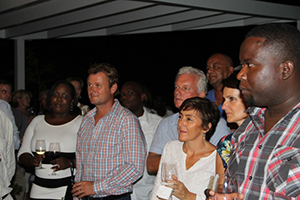 The assurance came from Vice President of the FSRE Nevis David Chekemian at a cocktail party on November 20, 2014, to mark the official opening of the high-end villa development. “This project has continued to create jobs for many local contractors and suppliers and FSRE sees this aspect of the [Citizenship by Investment] CBI programme as extremely important and we are dedicated to building all of our homes here with 100 percent local contractors,” he said. Chekemian noted that FSRE was pleased to officially open its first villa of the 15 homes planned there under the CBI programme. “FSRE is extremely excited about opening our doors here at the Villas at Pinney’s Beach and we feel this project speaks to the spirit of the Citizenship by Investment programme. “It offers individuals the opportunity to invest in very high- quality real estate product and in return gives them the privilege to become citizens of this great Federation of St. Kitts and Nevis,” he said. Deputy Premier and Minister of Tourism Hon. Mark Brantley in brief remarks welcomed Chekemian’s assurance that the labour force for construction would come from Nevis. “I think this is an excellent opportunity, an excellent realisation of a dream here that we are seeing unfolding. I like the spiel about 100 percent Nevisian labour. What you see here is all Nevisian. “It demonstrates what we are capable of and for my part, I like the fact that we are employing people. We are generating local income. Lawyers are making some money. The realtors are making some money…I am very anxious to see the whole build-out as it progresses and so for me this is very important,” he said. 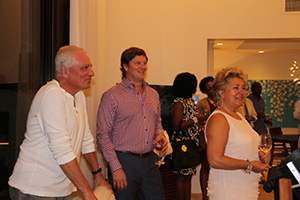 Mr. Brantley also expressed hope that although the villas were being constructed under the Citizen by Investment programme, the buyers would embrace the lifestyle on Nevis. 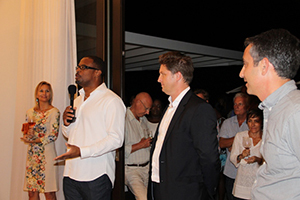 “The Citizenship by Investment programme, clearly this is being built specifically for that but I’m hopeful that most of your buyers are actually looking for the lifestyle that Nevis offers and citizenship is secondary. I think the two things go very nicely together,” he said. Meantime, Managing Partner of St. Kitts/Nevis Residents and Citizenship from Henley & Partners Caribbean Ltd. Christopher Willis who was also present, stated that his organisation shared a good working relationship with FSRE and was excited about attracting more economic citizens to St. Kitts and Nevis. “We have a very great working relationship with FSRE and its one that we will continue to develop over the years. Although this is Villa 2001, there’s another 14 that will be stretched out over the coming years. “We are very excited about watching them take shape and develop here on the island of Nevis and also we are excited about the possibilities of bringing in more economic citizens and the benefits that will bring to the Federation of St. Kitts and Nevis. The cocktail party was hosted by FSRE’s new Director of Sales and Marketing Eric Johnson.